The 12-foot-tall cornice that rings One Hancock Plaza, the newly renovated heart of downtown Gulfport, Mississippi, shines brightly from dusk to dawn. The gesture has literally transformed the 15-story headquarters of Hancock Bank into an oversized lighthouse, visible from miles around and well out into the Gulf of Mexico. It's a pleasing outcome for the bank, whose corporate logo is inspired by the nearby Ship Island Light Station, a wooden structure that the bank helped rebuild after it was lost to fire in 1972. The lighthouse led generations of mariners to safe harbor along the Mississippi Gulf Coast, withstanding hurricanes and more - a fine metaphor for a financial institution. Until August of 2005, that is. Hurricane Katrina's unprecedented surge swept away Ship Island Light Station and tore away at One Hancock Plaza and much of the Gulf Coast. 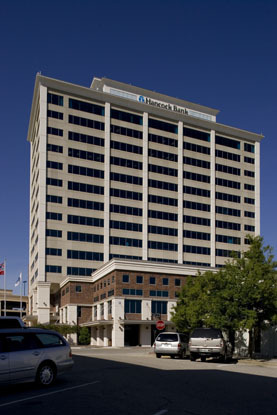 Just months later, however, without its lighthouse or home office, the bank bounced back, unveiling plans to invest $35 million in a major renovation of the 1981 building and its site. The seasoned, versatile designers at Grace and Hebert Architects, it was announced, would capture "the resilient spirit that the lighthouse embodied" by transforming the bank into a beacon of the area's rebuilding and rebirth. Today, occupants of Hancock Bank's class-A office space keep watch over the Gulf night and day. 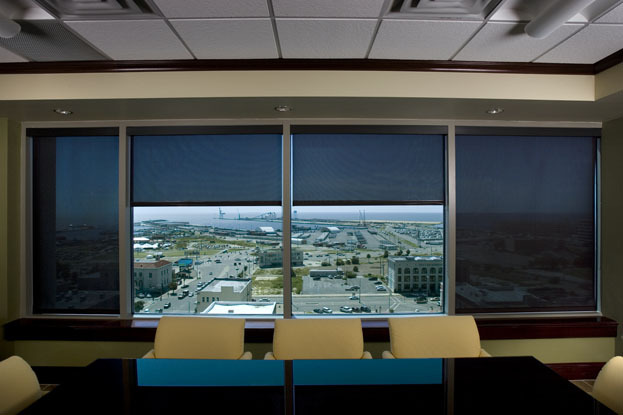 Even during the brightest hours, Hunter Douglas Contract Clutch Roller Shades control glare to allow for enjoyable, panoramic views in every direction. 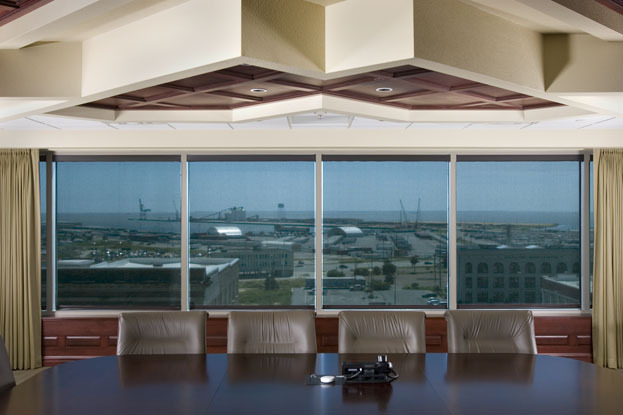 Thanks to the fabric shades, the relatively thin curtain-wall facade with large window openings is suited well to the Gulf shore's sunny days. Other architectural upgrades were developed to ensure this lighthouse weathers the next major storm, says Gary J. "Jimmy" Hebert, Jr., project manager with the 40-year-old, 40-person Grace and Hebert. 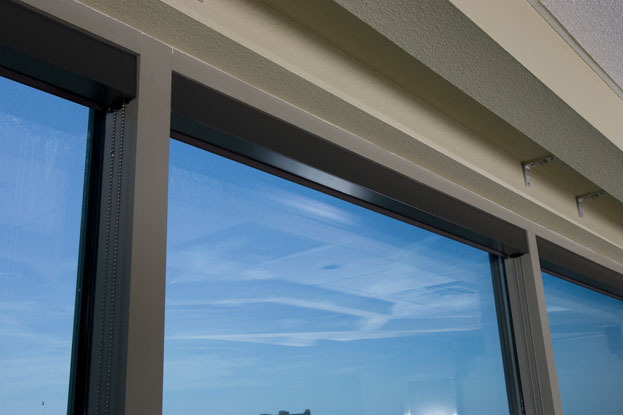 "For hurricane protection, we designed the roofline to withstand high winds, including a concrete roof on the penthouse, and we developed a hurricane-resistant glazing system," Hebert explains. 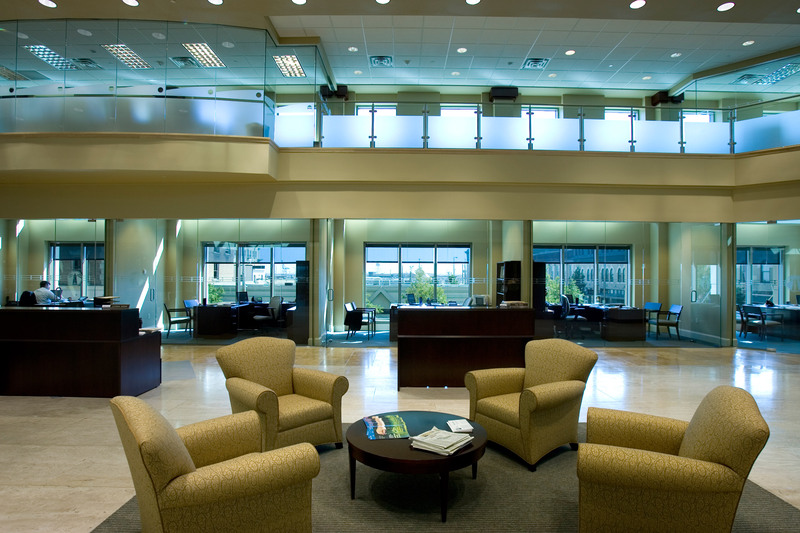 At the client's request, the architects detailed the building enclosure for severe weather. The blue-tinted, insulated glass was specified with a protective film to protect against windborne debris. "The design withstands large missile impact to the eight floor, and small missile impact to the top floor, which exceeds code requirements," he adds. For cladding, a new flat-stone exterior was detailed in a timeless, neutral bone white, with a brick red base of classically proportioned arches and columns. "The exterior of the building looks totally different now - the materials are more modern, but in a traditional, conservative type of design preferred by the bank," says Hebert. "With the crown molding lit up, the building can be seen from miles away." 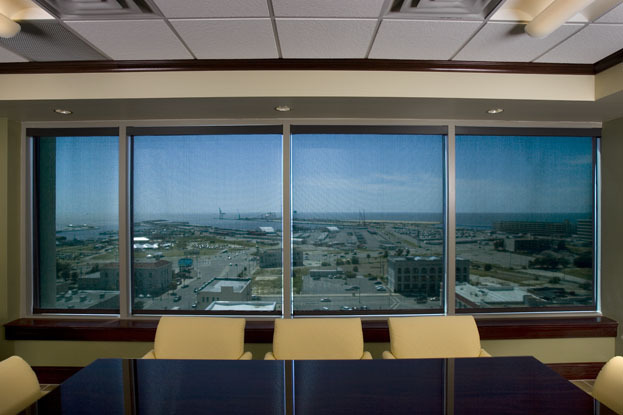 What can't be seen from miles away are the new interior amenities enjoyed by tenants of Gulfport's premier office address. Inside the building, says Hebert, "Every floor was gutted and everything was totally redone, top to bottom. 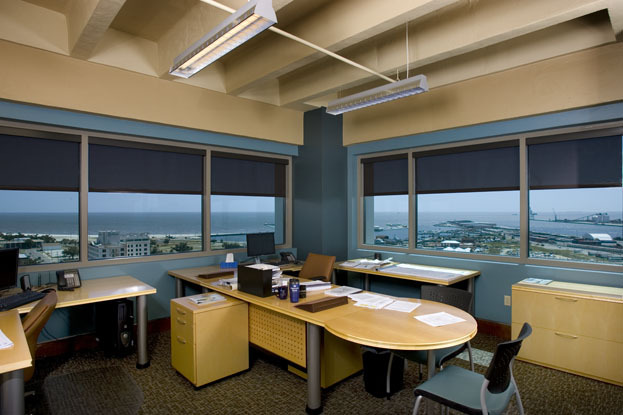 The Hunter Douglas Contract shades are used throughout, and you can see through them, so you have beautiful views of the Gulfport coast and various islands off shore. You can see all the way to Biloxi and its coast, too." According to Hebert, the new interior design creates highly productive work environment - not just a visually impressive series of spaces. 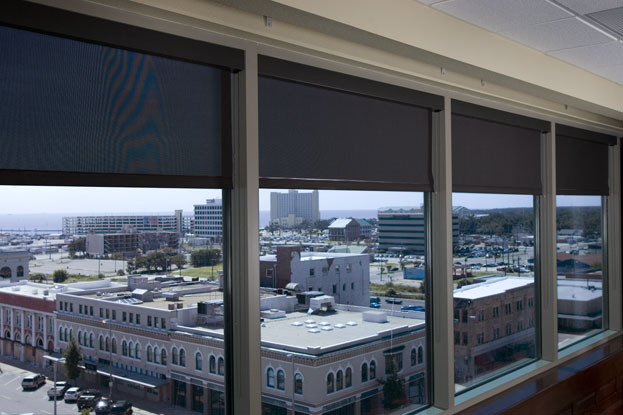 Hebert Blind Company of Baton Rogue, Louisiana installed more than 800 Clutch Roller Shades in Sheerweave 4000 Fabric throughout the building. 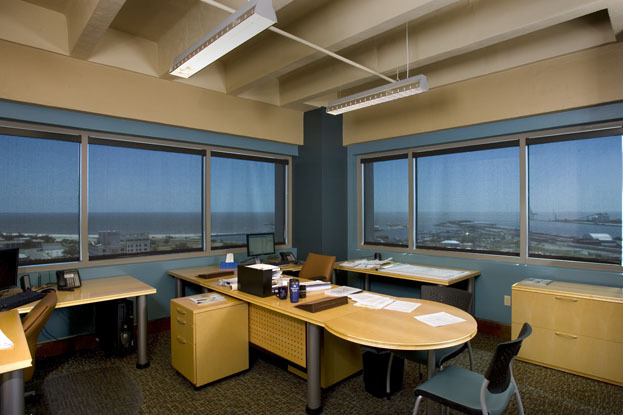 The refurbished interiors provide crucial solar control for minimizing glare, especially on computers screens. For additional illumination control, photosensors are integrated into the lighting system so that the fixtures automatically dim when the sun is bright. 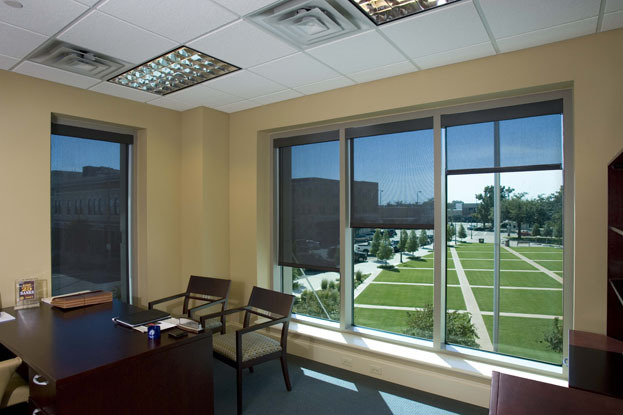 The shades also control heat, adds Hebert, though to a limited degree. The effect within the spaces is slick and integral to the architecture. 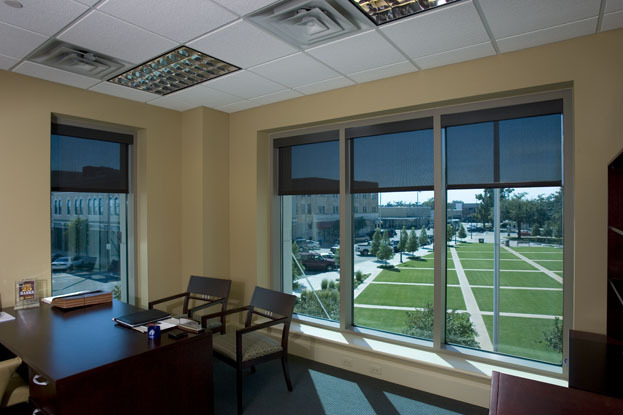 The roller shades are hidden within dark rectangular valances specified to approximately match the width of the window mullions, which are in a contrasting hue. When operated, the shades appear coordinated and neutral regardless of whether their heights are set to match or not. The high-performance fabric filters light yet appears uniform and practically invisible throughout, especially when all are fully closed throughout a space. The discrete chain for operating the shades hangs hidden along each mullion's depth. 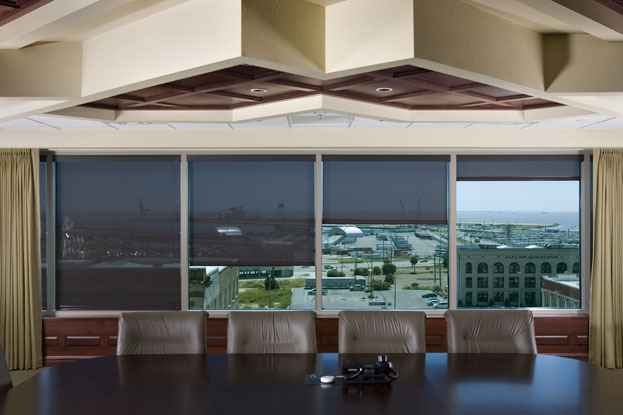 The roller shades are employed in virtually every perimeter space in the building, from the elegant floor-through lobby to the staid, wood-paneled boardroom on the seventh floor to the funky corner office with exposed ceilings on the on 14th floor. From the lower floors, occupants enjoy views of meticulously manicured green space outside, which were added to re-establish Gulfport's tallest building as a hub of downtown community activity. In this way, Hancock Bank's home reinforces its central role in the revitalization following the hurricanes of 2005. More than a physical expression of the renewal of Gulfport, it has also re-emerged as the core of the city's vitality and commerce. Like the lighthouses dotting the Gulf Coast, "the lights of the Hancock Bank building help you find your way," said Gulfport Mayor Brent Warr, when the project was announced. "If you're on your boat headed to shore through rough waters, the light of Hancock Bank leads you toward safe harbor."